Don’t say “Thank You” until the end. My friend, the very smart BIFF LEVY, Esq. travels a lot to China and other points beyond. He noticed this column in the Financial Times by DAVID TANG, a Chinese enterpreneur — and an “Agony Uncle” columnist. 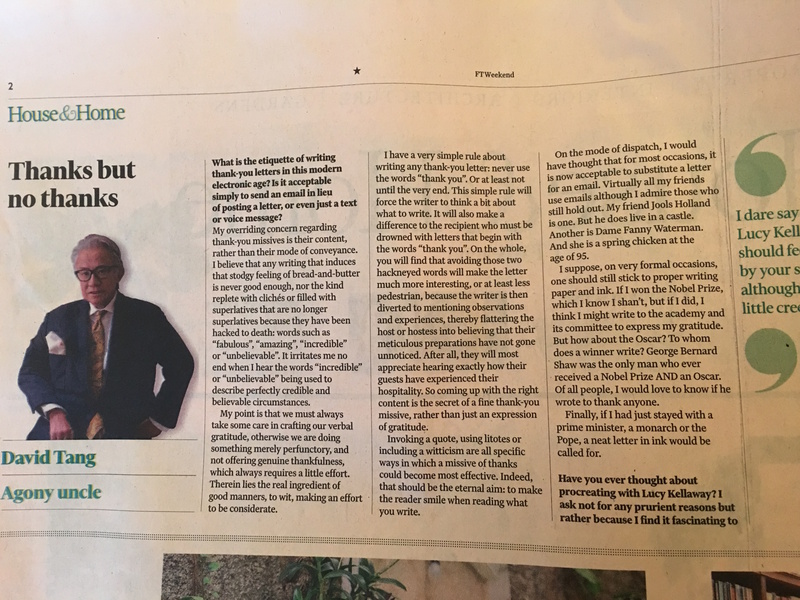 Biff explained that in China, advice columnists are considered “Agony Aunts” — hence, David Tang’s carved out an unusual niche as an expert “Uncle”. His technique: Don’t say the words “THANK YOU” until the end of your letter. Bring us into your experience first… share the feelings.. and then lead us to the “Thank You” at the end. He does such a good job of articulating this that I want to … thank him!